Effective communication remains the most obvious success factor for change management in an organisation, yet it is also often the most poorly managed and the most likely to bring the change project to a grinding halt. The communication message should be built around the following four issues: the precise nature of the change ~ the potential advantages and benefits of the proposed change ~ how and when the change will take place ~ the people aspects of the change. Each of these issues requires separate attention in developing a communication strategy and this column can only call attention to the imperative need for effective communication of the change plan to everyone involved. This will help to overcome the inevitable resistance and encourage active participation from employees across the organisation. In preparing the communication strategy for any change programme, the team in charge of the initiative should look at each issue in detail, including answering the following 14 “Must-Ask” questions. It may seem that, if the initiative has been well prepared, the answers will be obvious. However, they are often overlooked. In addition, these are the questions that the change team will most often be asked by staff. If the team is not able to answer them clearly, quickly and convincingly the change programme has little chance of success. What is the precise nature of the change? Why, exactly, is the proposed change necessary? Why are current practices not going to be good enough in the future? How can the cost and disruption that the change will inevitably cause be justified? What will be the advantages and benefits of the change? What will be the benefits of the change for customers and investors? What will be the benefits for us (the employees as a whole)? What will be the benefits for me (the individual employee)? Where will the change place us in relation to our competitors? How and when will the change take place? Over what time-scale will the change take place? What factors could make the time-scale longer or shorter? Will the organisation be ready for the change when it happens? What will happen if it doesn’t go according to plan? What are the people aspects of the change? Who is running the change initiative? Why should people accept the change? What can people do if they disagree with the proposed change? 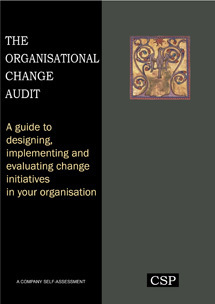 These questions are derived from The Organisational Change Audit - a fully scoreable, self-assessment audit from Cambridge Strategy Publications.